Swedish Swedish massage is the most common and best-known type of massage in the West. If it's your first time at the spa or you don't get massage very often, Swedish massage is the perfect massage for you. Shiatsu massage therapy helps you relax, realign and rejuvenate. There are many positive aspects to receiving massage therapy on an ongoing basis, and with the busy lives we lead, we can all benefit from a little stress-management. Acupressure massage Acupressure is an ancient Chinese technique based on the principles of acupuncture, and involves the use of finger pressure (without the eedles) on specific points along the body Acupressure is is a way of accessing and releasing blocked or congested energy centers in the body. Aromatherapy massage Aromatherapy massage is particularly suited to conditions involving stress or improving emotionally-related conditions.When you inhale essential oil molecules, messages are transmitted to the limbic system and affect heart rate, stress level, blood pressure, breathing, memory, digestion, and the immune system. 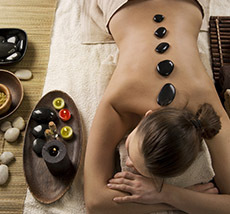 Hot Stone Massage uses cold or water-heated stones to apply pressure and heat to the body. Stones coated in oil can also be used by the therapist delivering various massaging strokes. The hot stones used are commonly Basalt stones (or lava rocks) which over time, have become extremely polished and smooth. As the stones are placed along the recipient's back, they help to retain heat which then deeply penetrates into the muscles, releasing tension. Once a costly treatment available only in luxury spas, the deep-relaxation therapy of hot stone massage can now be enjoyed at Taiji Body Work. The penetrating warmth of polished natural volcanic basalt stones placed on key acupressure points slowly releases heat to ease accumulated tension on your body, calming your mind and spirit, while cleansing toxins from your body. Sports massage Sports massage was originally developed to help athletes prepare their bodies for optimal performance, recover after a big event, or function well during training. Sports massage emphasizes prevention and healing of injuries to the muscles and tendons. Prenatal massage Prenatal massage shares many of the goals of regular massage -�C to relax tense muscles, ease sore spots, improve circulation and mobility, and just make you feel good. But it's also tailored specifically to the needs of pregnant women and their changing bodies, and therapists who are trained in prenatal massage adjust their techniques accordingly. Couples Massage Enjoy some quality relaxation time with your loved one. Both of you will feel refreshed and rejuvenated while experiencing one of Taiji's award winning massages. Cupping is an ancient Chinese form of alternative medicine in which a local suction is created on the skin; practitioners believe this mobilizes blood flow in order to promote healing.A partial vacuum is created in cups placed on the skin either by means of heat or suction. Scrub A scrub is a popular that is like a facial. It exfoliates and hydrates your skin, leaving it smooth and soft. A body scrub is done with an abrasive material like salt, sugar, coffee grounds, rice bran, even pecan hulls, usually mixed with some kind of massage oil and an aromatic like essential oils. If the scrub uses salt, it might be called a salt scrub, salt glow or sea salt scrub. The exfoliation is usually followed by a shower and an application of body lotion. This is not a massage.